Over 10 million Europeans are Nordic Walking (Ski Walking) in the cities, out in the country and up in the mountains. Nordic Walking is the fastest growing fitness activity in Europe. And now Americans of all ages and athletic abilities have the opportunity to unlock the calorie burning and aerobic benefits of Nordic WALKING Poles. The American Nordic Walking System and WWW.SKIWALKING.COM Nordic Walking Poles are #1 in Nordic Ski Walking in the USA. 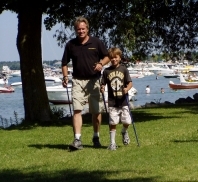 We are dedicated to providing Americans of ALL ages and ALL fitness levels with quality Nordic Ski Walking Poles. We promote the simple fact that one-piece poles custom fit to each individual's height are safer, lighter and much more durable than cheap/flimsy 2-piece and 3-piece twist-lock and flip-lock collapsible poles that tend to rattle, vibrate, freeze-up and/or collapse unexpectedly. All of our poles are equipped with real Nordic Ski Walking straps - kind of like a fingerless glove. Our comfortable patented straps are patented by the Salomon Ski Company. According to Nick Mahood, SWIX USA Nordic Walking Director, "Pete Edwards, SKIWALKING.COM's owner/founder, has single handedly introduced thousands of Americans to Nordic Walking through his enthusiastic clinics! I have no doubt that Edwards is the #1 retailer of Nordic Walking Poles in the USA! You can quote me on that!" When using the correct length poles everyone is automatically forced to walk taller - with hips forward and with a straighter back. Men even stop walking like apes! Better posture is biomechanically a good thing. Combine this improved posture with the unique 4-Wheel-Drive action of walking with fitness poles and there is a noticeable decrease in the stress put on the weight bearing joints. It is not magic. It is just physics. Balance and stability are also hugely improved. Nordic Ski Walking burns up to 40% more calories than walking without poles. Ski Walking also reduces knee and joint strain. Ski Walking naturally loosens & strengthens the neck, back and shoulders. Unlike walking, running and biking, Ski Walking works the arms, shoulder and abs. "My Nordic Ski Walking poles have been a terrific addition to my regular exercise program. I love the way they incorporate my upper body during a walk, thus giving me more strength-training and calorie burning for the time spent. I highly recommend them to everyone!" "I am now an avid Nordic ski walker and I am preaching to all those I meet! I have recently lost 85# and was looking for a way to make my walking routine a more intense cardiovascular workout. This was made a little bit more difficult by the fact that I have osteoarthritis in my hands, feet, and knees, and a history of chronic trochanteric bursitis in my left hip. I can't just increase my mileage, and I can't jog. I tried walking with weights. Ugh! Then I learned about ski walking when I was browsing in the Lands' End catalog. I googled on ski walking and found you. I was hooked after my first walk. I've been walking at least 5 days a week for 2-3 miles a day. I am doing great! You can see the muscle development in my arms. And my waist is disappearing. I've gotten several of the physical therapists at my hospital hooked. ( I am a pediatrician and the medical director of a Women's Wellness program) My mother has severe osteoarthitis and osteoporosis and is recovering from a hip fracture. I just ordered her a set for Christmas. This is a great idea for people with arthitis, osteoporosis, and balance problems. My plan is to start up a ski walking club next spring as part of our Women's Wellness program. Thanks. Keep working on getting the word out. This is a form of exercise that anyone can do." The NEW 2008 EXEL Carbon Urban Skier Poles are $129.95 per pair. All poles come with a free Nordic Ski Walking DVD! For more info please call or send us an email. When Pete Edwards, owner/founder/coach of SKIWLAKING.COM, had to give up marathon running Nordic Ski Walking saved the day. Nordic Ski Walking provided an effective workout that was gentle on the shins, knees, hips and back. Pete Edwards has been coaching runners and skiers of all ages and fitness levels for over 25 years. Edwards is a former ski school director, running coach, personal trainer and the owner/founder/coach of The American Nordic Walking System and SKIWALKING.COM Nordic Ski Walking Poles, headquartered in Glen Arbor, Michigan. Edwards has coached State Champions (individuals + teams), All-Americans and National Champions. He has also introduced Nordic Walking to 1000’s of Americans through Nordic Ski Walking clinics, radio interviews, newspaper interviews and TV interviews. He has skied in 50K marathons and run 26.2 miles marathons. His skiers have been hill bounding and ski walking with poles for years in the summer when deprived of snow. Hosting Nordic Ski Walking clinics is extremely enjoyable for Edwards and he especially enjoys hosting Nordic Walking clinics for MS, Parkinson’s and Neuropathy support groups, plus Wounded Warriors group. Edwards also donates his quality Nordic Walking Poles to Wounded Warriors stationed at Walter Reed, Fort Carson, Fort Lewis/Madigan/McChord and Vicenza, Italy.